Action in the game between Sri Lanka National Pool and National Youth team. 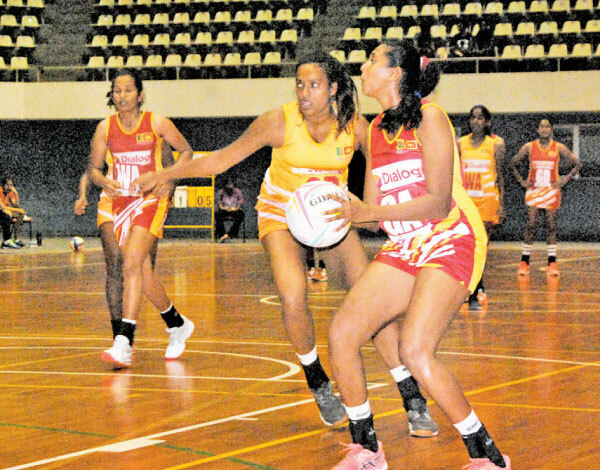 Malaysia defeated Kenya 44-42 in a close game to remain unbeaten in the ongoing Invitation Triangular Netball Series at the Sugathadasa Stadium yesterday. In the opening quarter Malaysians were in front with a slender one point to be 12-11. During the second quarter they extended it by 12 goals while Kenyans could add only 8 goals giving Malaysians a lead of four goals. From the third quarter the game became a ding dong battle as the Kenyans fought back gallantly to collect 11 goals while their opponents too added the same number of goals to their tally bringing the score to 30-34. The Malaysian girls had to fight with all their strength in the final quarter as the Kenyans came back with everything they had in store to challenge their fast-moving opponents. This was the best quarter for the Kenyans with 12 goals whereas Malaysians could muster only 10, but the lead they gained in the early quarters helped them to emerge winners. The second game between Sri Lanka National Pool and Youth Pool ended in favor of the senior pool by 73 goals to 34. The Youth team was never able to come closer to the seniors and always trailed in all four quarters - 22- 8, 40-17, 60-30 and 73-34. Today Sri Lanka Youth Team play Kenya in the first game scheduled to commence at 3.00 p.m. followed by Malaysia v Sri Lanka at 5.00 p.m.